We all had a wonderful first day in Madrid. After leaving the airport, we headed to San Gines for the best churros in Madrid. We then went on a guided tour of the city. Our guide made interesting comparisons between the Spanish and Arabic cultures. We learnt for instance the etymology of the word Madrid, which comes from the Arabic Ma gerit (water flowing). The students then had an opportunity to walk around the main cobbled shopping street of Madrid which leads from the Opera to Puerta del Sol, and purchase some souvenirs. We visited the impressive Royal Palace with its 3000 rooms, which makes it the biggest palace in Europe. We then explored the Museo del Prado and ended the day with a guided visit of the stadium of the biggest football club in the world: Real Madrid! The day ended with a degustation of tapas with some traditional queso manchego, tortilla de patatas and fish. Day 3: We arrived in Toledo this morning, and the city of Toledo mesmerized us all. After a guided walking tour, we visited a cathedral, a synagogue and a mosque in a city renowned for the peaceful coexistence of its three religious communities. We have a long journey ahead of us tomorrow, as we venture into the land of the Vandals, Andalucía. Day 4: Today was all about Flamenco. After our long ride from Toledo to Sevilla, we headed to the Museum of Flamenco. After the visit, where the students learnt about this folkloric dance, we all had a 45 minute dance lesson. I can honestly say that we all thoroughly enjoyed it. Even our dance teacher was impressed! We sampled some delicious traditional vegetarian Andalusian dishes for dinner: olives, tortilla, asparagus, paella and mango mousse for dessert. Tomorrow we have a guided visit of Sevilla, followed by a trip to neighbouring Granada. Hasta pronto. Day 5: Sevilla, the capital of Andalusia, with its rich historical heritage captivated our interest. Our guide first took us through a maze of narrow streets recounting the city’s Roman, Wisigoth and Arab history. We then saw the mighty Cathedral of Sevilla with its Giralda, and visited the Alcazar de los Reyes, the Castle of the Kings. The visit was followed by a walk to the River Guadalquivir where we saw the Golden Tower, and we ended our exploration of Sevilla at the beautiful Plaza de España where numerous films were shot. From there, we boarded our coach to Granada and did some light shopping in “el Corte ingles”. Tomorrow, we all look forward to discovering the most beautiful palace of the world: the Alhambra. Day 6: We woke up in the beautiful city of Granada, and were at the doors of the Alhambra at 9am. Our guide, Juan, took us on a three hour lvisit of this 13th century palace. From the Patio of the Lions to the Gardens of the Generalife (Heaven of the Kings in Arabic), the students were fascinated by the beauty of the palace, and its history. 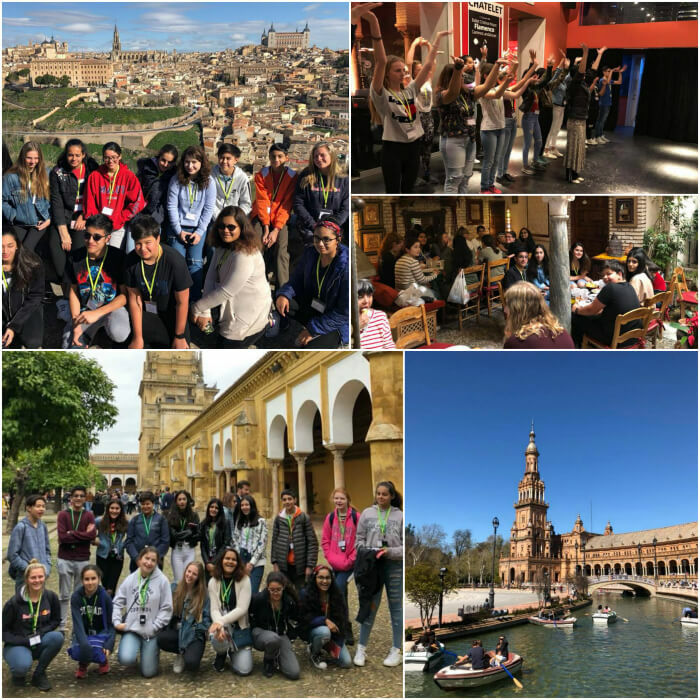 After our visit, we boarded our coach bound for Cordoba, and went on a leisurely stroll to take a peek at the 8th century Mosque, and cross the Roman bridge standing over the Guadalquivir River. We are all feeling a little sad that tomorrow is our last full day in Spain, but look forward to our visit of one of the jewels of Andalucia: la Mezquita de Cordoba. Today, for our last day in Spain, we visited the oldest mosque in Europe, la Mezquita de Cordoba, built in 785. Our guide, Manuel, was once again very friendly, humourous and clearly passionate about the history of his city. He then took us on a tour of Cordoba’s Jewish quarter. We then boarded the coach to return to Madrid. Tomorrow, we are flying back to Bahrain, and look forward to seeing our friends and family.